RJC Yacht Sales is proud to announce the sale and closing this week on the 2008 130' Westport Tri-Deck Motoryacht, KEMOSABE! This was an in-house sale with Bob Cury representing both Buyer and Seller. 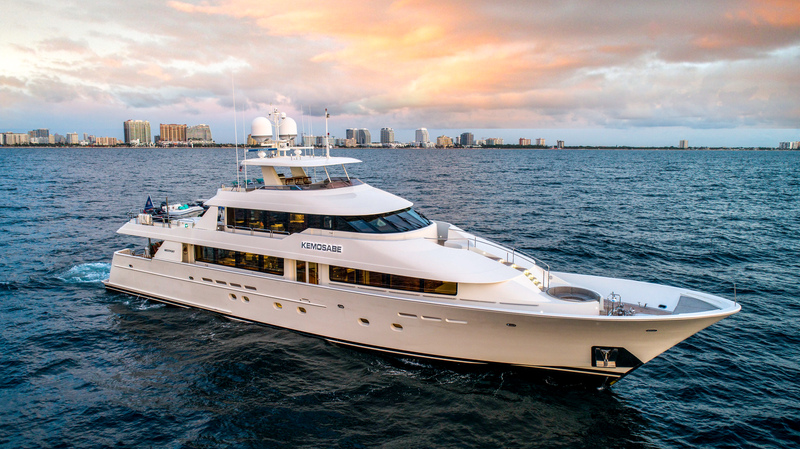 KEMOSABE is a highly customized 130 Westport that benefited from multiple upgrades and refit over the past few years. In 2015 her interior was custom designed by Robin Rose featuring raised mahogany joinery throughout and included all new soft goods in neutral tones with sea blue and navy accents. Also in 2015 the vessel was refit with new Naiad "at rest" stabilizers, upgraded electronics and audio/visual equipment and this past year, two new Northern Light 65KW Generators were installed. Additional large yacht options aboard the vessel included bow & stern thrusters, hydraulic passerelle, teak decks, flybridge helm station, Jacuzzi tub along with Alpha Laval and Headhunter treatment systems. As for water toys, the vessel is also equipped with an 18' Novurania tender, two Sea Doo waverunners with water jet pack boots. The new owner will rename the vessel BESS TIMES and will base out of Miami Beach, FL and Bahamas. Her asking price was $ 11,500,000. Click here to view current Westport Yachts for Sale!